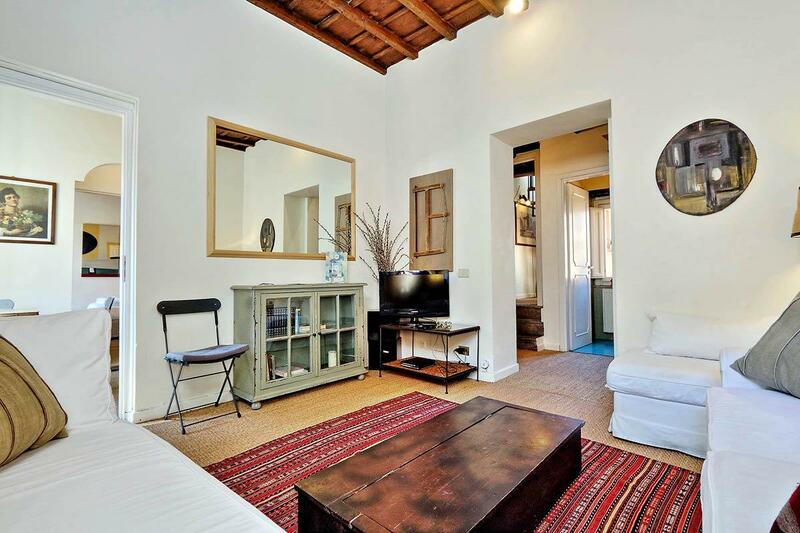 This lovely Rome accommodation occupies the third floor of a historical building (without a lift) on Via di San Vicenzo. Ideal for large groups, it accommodates up to 8 guests. Divided into two main sections, the rental features two stylish living areas and two master bedrooms. The living areas include sofa beds to accommodate four extra guests. Recently renovated by a famous designer, the interiors are extremely stylish. The first section of the residence features a lovely rooftop terrace with beautiful views of the surrounding monuments, which can be accessed through a small spiral staircase. 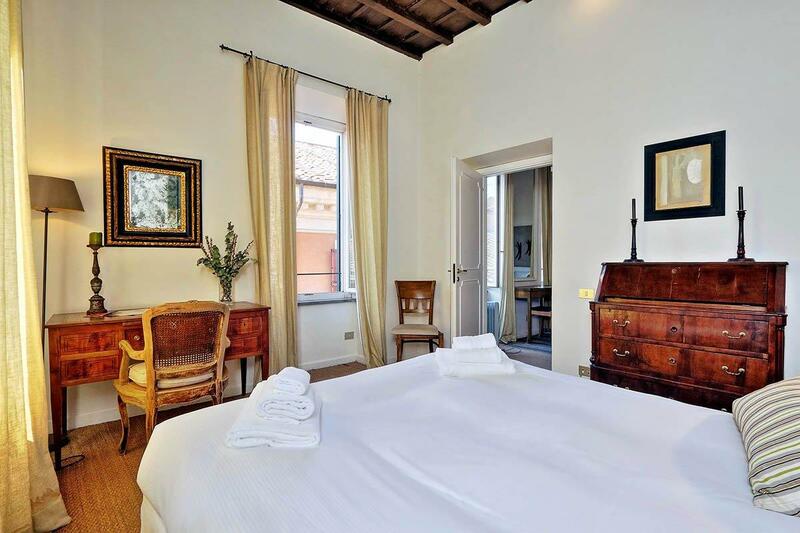 From the other section, guests may gaze out at the Roman rooftops and cupolas from every room. Both living areas have high wooden ceilings, white sofas with colorful pillows, a coffee table, contemporary art paintings, and 32” flat screen TVs. Shades of grey, white and beige blend together with brighter colours to create an elegant and intimate feel. The first master bedroom is bright, simple and elegant with night tables, lamps and large wardrobes. The second master bedroom is very quiet at night with night tables, lamps and closets. A total of 3 bathrooms feature in the accommodation, one for each master bedroom and an additional one. The residence offers exclusive, private enjoyment of the surrounding beauty, specifically in the quiet of the evening. Both sections feature well-equipped kitchens with electric stoves, ovens, refrigerator/freezers, and Italian coffeemakers. They include all the necessary cooking equipment to whip up a home-cooked meal with local ingredients from the shops and outdoor markets nearby. 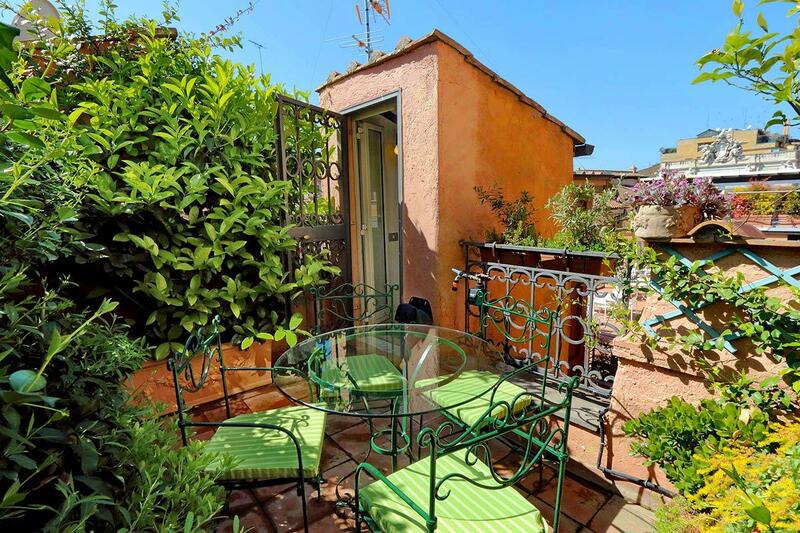 We recommend this combination of side by side apartments on the same landing for anyone who wants to enjoy the centre of Rome in a group. The option of separate sections allows for large groups to travel together whilst preserving their own privacy. A Wifi connection, Hi-Fi system and air-conditioning feature throughout the property.